While the oven is heating up place the almonds in a mortar and pestle and smash them into smaller pieces. Place the carrots with stems attached but trimmed on the parchment and brush them with avocado oil. Bake them for 10 minutes. Once they seem to be softening up slightly, turn the oven to broil and cook the carrots for one to two minutes longer. Once they've been browned to your liking remove them from the oven and transfer them to a serving plate. 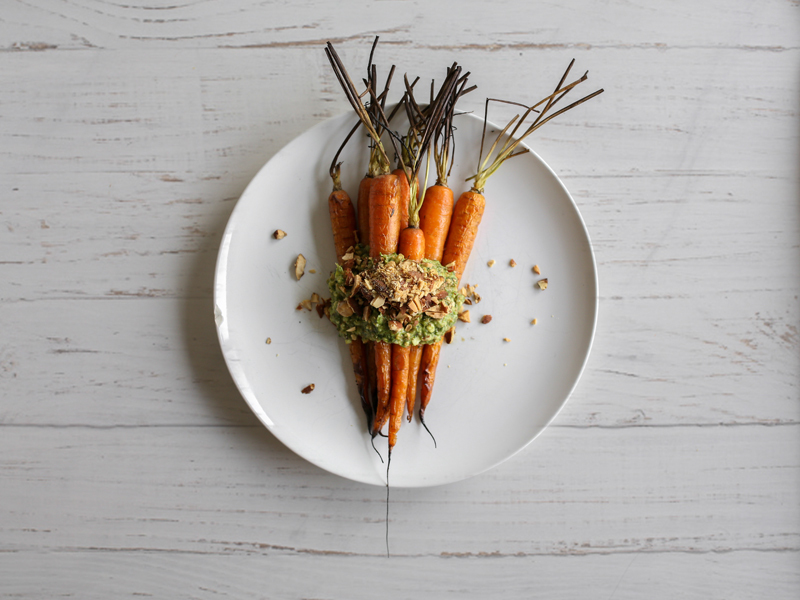 Top the carrots with 2 tbsp arugula pesto and crushed roasted unsalted almonds. Combine all ingredients in a food processor or a blender. Blend until the ingredients are well combined. Transfer the pesto to a container and store in the fridge.